In 2018, we had the privilege and opportunity to work with our residents through the creation of the Citizen Financial Review Task Force and our biennial Community Attitude Survey. We also accomplished goals set forth in our Keep Powell Moving plan and broke ground on our ninth park – Seldom Seen Park. Watch our year in review video here. Our 2018 Police Department Annual Report is available here. City Council created the Citizen Financial Review Task Force at the beginning of 2018 to review the conduct a comprehensive review of the City’s current and future financial position, identify cost-containment efforts and other solutions the City could implement to sustainably fund capital maintenance needs. 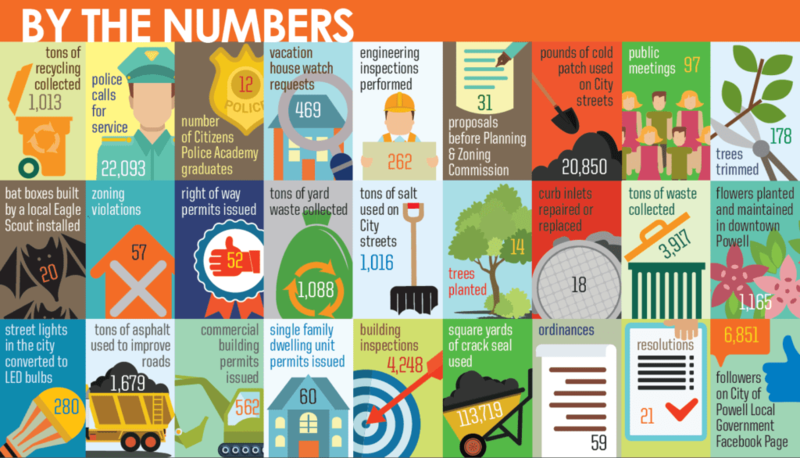 The 18-member committee, comprised of a cross-section of residents and business owners, spent more than 300 volunteer hours learning how the money comes in and how the City spends it to maintain the streets, bike paths, parks and traffic signals we all use. The Task Force recommended that City Council put forth a ballot measure this past fall that would raise the $2 million needed for deferred and future capital maintenance needs. This income tax measure was turned down by voters. City Council will continue to work with the community to explore other options to fund the City’s capital maintenance needs. The City collaborated with Columbus-based Saperstein Associates, Inc. to conduct a biennial Community Attitude Survey in the winter. This research gives residents of Powell a voice. It allows the voting public to express opinions on myriad issues – and, in doing so, provides City officials important data as planning for the future continues. Residents were asked over the phone about a variety of topics pertaining to Powell, from what they like most about living in the City to what public officials should consider to be top priorities for the future. A report of the findings are available here. Powell City Council approved the Keep Powell Moving Plan in late 2016 as an effort to improve traffic circulation, add parking and increase walkability and bicycling in our community. -Delaware County opened the Jewett Road roundabout. -New traffic signal installed at Grace Drive and Liberty Street intersection. -Detour signage was installed to reroute traffic away from the Olentangy and Liberty Street intersection. -Enforcement blitz conducted by the Powell Police Department at the Olentangy and Liberty Street intersection to ensure motorists are not making illegal left turns during prohibited timeframes. -Improvements were made on the City’s section of Presidential Parkway and Sawmill Road. Crews broke ground on the City’s ninth park – Seldom Seen Park – this past spring. Seldom Seen Park is a 23-acre active park site along the north side of Seldom Seen Road west of the railroad tracks. The new park is on track to open later this year and will feature several athletic fields, multiuse paths, an extensive wetland area and a natural playground. This new park is one of the key components of the City’s 10-year capital improvement projects plan. Powell voters passed a $7 million bond levy to fund a portion of capital improvements needed in the City during the Nov. 2012 election. Funds were used for Murphy Parkway, bike path extensions and repairs, traffic signals, park improvements and the first phases of Seldom Seen Park. This year we will see progress on many commercial developments, including Traditions Plaza. Center at Powell Crossing and Armita Plaza – all within walking distance of our downtown. We’re also continuing to work with The Ohio State University Wexner Medical Center on the proposed healthcare facility at the northeast corner of Sawmill Parkway and Home Road. As always, check our website at www.cityofpowell.us for up-to-date news and information. We hope to connect with you at one of our upcoming Coffee with the Mayor and City Manager events or on Facebook, Twitter, Instagram, NextDoor or LinkedIn.